We have added a new feature to MFT.com. It is an opportunity for our readers to contribute to this website. You can write an article, share your hardgainer knowledge or share your tips and techniques. Go to the Hardgainers page to have your take. If you stopped to read this page you are probably like me, a "hardgainer". We've been called the skinny guy, the bean pole, the twig and now the scientific term, ectomorph. Ectomorph is a five dollar word describing body types that generally have low muscle mass, long limbs, slender bone structure and fast metabolisms. So if you are sick and tired of your body and want to see a new muscular you in the mirror? Then stick around and learn how gain lean muscle mass with hardgainer routines gathered from across the globe. Hardgainers also tend to have more than average endurance type muscle fibers, and higher levels of stress hormones like cortisol. So how do you combat this curse of nature? To gain muscle mass a hardgainer must consume enough calories. How do I know how many calories I need? Glad you asked. Multiply your body weight by 15. So if you weigh 150lbs, your daily calorie consumption will be around 2250 calories. (150x15=2250)This what you eat to stay at your current weight. To gain muscle, add 500 calories to your daily intake. So now you are at 2750 calories, split up into 5-6 meals per day. Fine tune the added calories so that you are gaining muscle and a minimum of fat. Carbs- Most experts agree that you should get about 60% of your calories from Carbohydrates. One carb gram equals 4 calories. Protein- Consume 1-1.5 grams of protein for every pound you want to weigh. If your goal weight is 175lbs, then you need 175-263 grams of protein every day. Again spread out over 5-6 meals. One gram of protein equals 4 calories. Fats-Keep fat intake to about 20% of your total calories. You will want to perform compound movements. Get as many muscles involved as possible. No isolation exercises. Squat-Works the glutes, quadriceps, erectors and hamstrings. Deadlift-Works lats, glutes, erectors, rhomboids, traps and teres. Bench Press-Works pecs, lats, triceps and front delts. Military Press-Works pecs, delts and triceps. Pull Ups & Bar Dips-Are proven mass builders as well. FLIP when you see it! ...THIS one actually gives you some KILLER HARDGAINER TIPS! => Your Body's 2 Most Anabolic Hormones...And A Crazy "Tag Team"Technique To Trigger An Explosive Surge Of Thick New Muscle! => The Hardgainer Workout Training Technique That Targets 373% MoreMuscle Fibers! => The $.08 "Miracle Supplement" That Literally DOUBLESMuscle-Protein Uptake For CRAZY New Mass Gains! Sound like a bunch of "hype"? Take action. Choose one of our recommended hardgainer routines or check out some of the quality paid programs you see advertised, and get started. Decide that you will not tolerate being skinny for one more day. Editors Note- Programs like that of Vince Del Monte are "best selling" for a reason. They work. Is the price that is holding you back? The No Nonsense Bodybuilding Program costs $77. Sounds like a lot of money right? But... it is only 22 cents a day. I did the math. Is the price of a stick of gum going to keep you skinny? I think you have more sense and resolve than that. The 10-8-6-15 routine was promoted by muscle legend Vince Gironda and has been used for more than 50 years. You perform four sets of each exercise. *Gironda's version of "maximum" is a weight in which you can just complete 6 reps.
Rest between sets is no longer than 60 seconds. Complete this full body workout 3 days per week- Monday, Wednesday, Friday. An old school, time tested, pack on muscle program is the 5x5 routine. This was a favorite of Arnold Schwarzenegger and his mentor Reg Park. If you are looking for a simple but brutally effective mass building program, check out Escalating Density Training by strength guru Charles Staley. This guy trains Olympians and Pro athletes. EDT is worth checking out. Tired of watching other guys work out half as much and get twice as big? 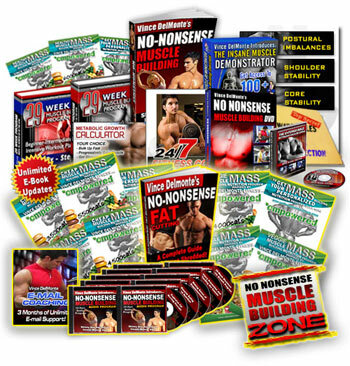 The #1 rated muscle program on the internet. "I actually added over 16 inches to my entire frame and gained over 30 lbs of muscle mass." "After 4 months I went from 163 lbs to 186 lbs and 17 of that was solid muscle! I actually added at total of 17 inches to my body."